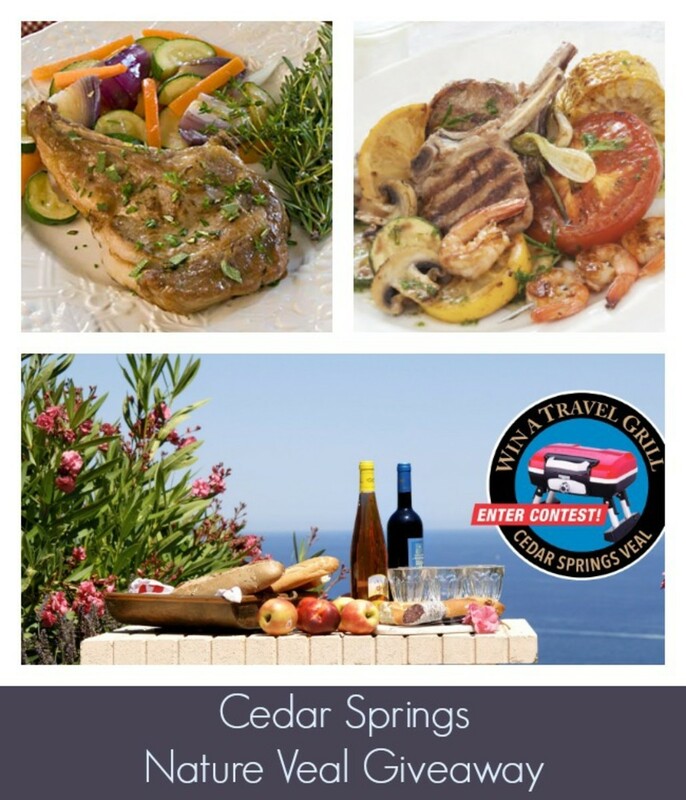 Summer Grilling Recipes from Cedar Springs Nature Veal and a Giveaway! Are you bored of the standard meat that is served at most barbecues, or maybe you are ready to mix up your own dinnertime options. We teamed up with Cedar Springs Nature Veal to share the news about the buttery, lean, and tender cuts that come from family farmers in the Eastern United States who are dedicated to producing the highest quality veal with the highest quality raising standards. On top of adhering to agricultural ingenuity, the Mountain States Rosen Co-op, purveyors oversee quality control from feed to processing and delivery  vertical integration ensures the meeting of rigorous quality standards from farm to the meat case -so consumers know that they are getting the best-in-class product that are fed a specially-developed, nutritious diet and are raised safely and responsibly. They are also hosting a fun contest called The Veal Deal where you could win a deluxe travel grillcompact enough for tabletop and travel, but spacious and powerful enough to enjoy an authentic grill-out for picnics, camping, tailgating, or romantic getaways. Be sure to enter here for your chance to win through August 9th! Also, be sure to check out their delicious collection of recipes on Mountain States Rosen with one of our favorites to grill up being the Lemon and Herb Grilled Veal Rib Chop with Shrimp Skewer that is an excellent source of lean protein, and a good source of niacin, zinc, and vitamins B12 and B6. 1. Mix olive oil, lemon peel, lemon juice, and herbs in a large resealable food storage bag. Place veal chops in bag, turning thoroughly to coat with marinade. Refrigerate chops in marinade for 30 minutes. 2. In the meantime, make the asparagus bundles by wrapping 3-4 asparagus stalks with pancetta slices around the middle. Skewer shrimp and place with asparagus bundles. Place in refrigerator until time to grill. 3. In additional resealable bag, place thick cut vegetables, holding tomatoes separately. Toss with small amount of olive oil and salt and pepper to season. Separately, season tomatoes with olive oil and salt and pepper. Place with asparagus and shrimp until time to grill. 4. Place all seasoned vegetables including asparagus bundles, tomatoes and thick cut vegetables over medium coals or medium gas grill grate until tender. Remove and hold in warm oven. 5. Place shrimp skewers and lemon slices on grill turning once until cook through and pink. Hold with warm vegetables. 6. Remove veal chops from lemon and herb marinade. Grill chops over medium coals or medium gas grill grate for 10 to 19 minutes; turning occasionally to desired degree of doneness. For medium rare cook to 145F, for medium cook to 160F, for well-done cook to 170F. 7. Serve chops with shrimp skewers, asparagus bundles, lemon slices and assorted vegetables. Win it: We are giving away a $50 gift certificate so that you can get grilling and test out some Cedar Springs Nature Veal. To enter, tell us why grilling up something lean, juicy and elegant-- grown on U.S. American farms--like Cedar Springs Nature Vealwould break the summer grilling doldrums. 1. Follow @MOMTRENDS on Twitter. 2. TWEET This Message: Enter to win a gift card from Mountain States Rosen to test out some delicious veal recipes on @Momtrends #giveaway #recipes http://bit.ly/16P7Q12? Full Disclosure: Winner must be 18 years or older and a US Resident. No purchase necessary. Winners will be notified via email with the specifics on how to claim their prize. Contest ends 9/1/13 at Midnight EST. Winners will be picked by random.org. By entering this contest, you will automatically be signing up for the Momtrends newsletter. This is a sponsored post.